Honey is a young female terrier X. She is a very sweet-natured dog who loves her cuddles. She is also energetic and would need a very active family who would bring her for long walks and have plenty of play sessions with her. 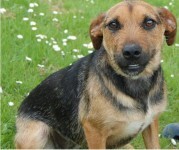 She loves other dogs and would make a great playmate for another dog. If you can give Honey a fun and loving home, please get in touch with us on 086-2112850, or at lostandfound@online.ie . We offer advice to those who have lost or found a pet. We arrange for emergency shelter for stray pets, and if an owner is not found, we make the pet available for adoption and ensure that a loving new permanent home is found.